Ronald came from a family of brewers (although it is said one of his forebears was Nicholas Brakspear c1100-1159 who as Adrian IV was the only English pope). 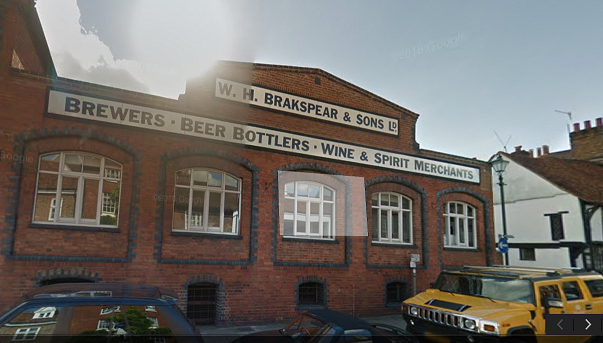 Ronald’s great-grandfather, Robert Brakspear, founded WH Brakspear & Sons Brewery in Henley in 1779. 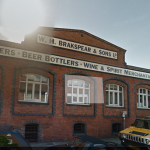 His grandfather, William Henry Brakspear, and his father, George Edward Brakspear, were also brewers, and Ronald followed in their footsteps, becoming a director of the family firm. Ronald was born in Henley in November 1875. 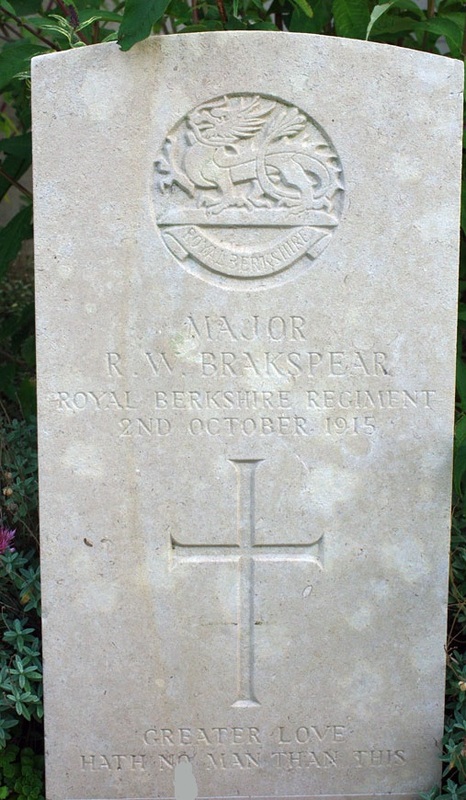 He was the first son of George Edward Brakspear and his wife Florence Elizabeth Sophy Perry, daughter of Reverend F R Perry. In the 1881 census, the Brakspears were living in Hart Street, Henley. (Hart Street is the main road which runs from the bridge over the Thames into the centre of town.) The family brewery was situated just behind, in New Street. On the night of the census, Ronald, age 5, was with his parents George and Florence and his three siblings: Florence, 8, Frederick, 3, and Lawrence, 1. The family also had four servants. Ronald attended Charterhouse School from 1889-1892, and was in Saunderites House. He joined the Rifle Corps there, rising to the position of Lance-Corporal. On 30 April 1903, Ronald married Marjory Willmer White, the daughter of Major, later Colonel, Owen Willmer White. They lived at 4 The Avenue, Datchet, and Connaught Street, Hyde Park, London. 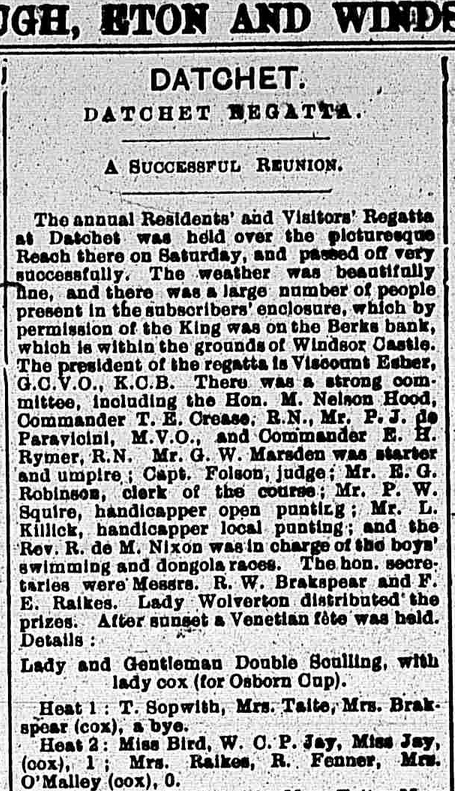 They were in Datchet on the night of the 1911 Census: Marjory age 31, and Ronald, 36, who gave his occupation as Company Director of Messrs WH Brakspear & Sons, Brewery. They had a cook and two servants. Ronald was said to be a splendid shot and a keen golfer. He and Marjory shared an interest in boating and they were active participants of Datchet Regatta. According to articles in the local newspapers, Ronald was in the winning six of a dongola race here in July 1907. Marjory won as cox in the mixed-double sculls in August 1908, and in 1909 she was cox of a team which included the aviator Tommy Sopwith. As well as participating in the regatta, Ronald played a role in organising it, as one of the honorary secretaries. Unfortunately, by 1913 Marjory and Ronald’s marriage was disintegrating. Marjory petitioned for divorce, alleging cruelty and misconduct. The sad tale of their failing marriage was reported in detail in the local press for all to read. Marjory told the court that in February 1912, Ronald’s conduct had altered. In the mornings, when he left for work, he never said good-bye. In the evenings, he would not speak to her. He went out after dinner and stayed out late. In the summer of 1912, Ronald told her he was going on holiday and when he returned, 10 days later, he would not say where he had been. When she asked for money for a holiday for herself, he wrote a cheque for £20 and threw it at her. Marjory said that when she remonstrated with him about his behaviour, he swore at her and on one occasion threw her against the door. Marjory was having trouble sleeping, was frequently in tears, and had lost a lot of weight. She had confided in her father, Colonel White, who tried to help but Ronald said he had lost all affection for his wife; he wanted her to go away and leave him alone. He admitted that he had been unfaithful. Marjory’s lawyer was reported as saying that he could see no greater cruelty than that of a husband not speaking to his wife for months and staying away from her. The President of the court disagreed and said that didn’t amount to legal cruelty. He did not think it was unreasonable for Ronald to stay away. Ronald was not driving Marjory away, he said, he simply wanted to live alone. The President was quoted as saying: “I have come to the conclusion that this is one of those cases brought in order that a wife may obtain her freedom and a charge of cruelty is put upon the record after she obtained evidence of her husband’s misconduct. The main charge appears to be his keeping irregular hours and that he did not give his wife his society. I am not satisfied on the evidence. Then, as regards her having been worried, there are many cases in family life in which worry affects the health but she that does not amount to legal cruelty. Does the lady want a judicial separation by reason of her husband’s misconduct?” Marjory declined, and the President dismissed the petition for divorce. The following year, on 13 January 1914, Marjory obtained a decree for restitution of conjugal rights but Ronald failed to comply and was considered to be guilty of desertion. Divorce proceedings followed. Eventually a decree nisi was issued on 25 June 1914 and the final decree on 11 January 1915. According to the court papers, in February 1914 Marjory was living at Woodhill, Gerrards Cross, which was probably her family home. Ronald must also have left The Avenue around that time as another military man, Leslie Nugent, moved in in 1914. Ronald returned to live in Henley where he donated money to the conversion of the Town Hall. The East India Club website explains: “On the outbreak of war he sold a painting which turned out to be a Dutch Master and with the proceeds said to be a £1m in current money he paid towards the conversion of Henley town hall into a hospital and maintained an interest in it.” He also volunteered for foreign service and obtained a captaincy in the 8th (Service) Battalion of the Royal Berkshire Regiment on 1 November 1914. The 8th had been formed at Reading in September 1914 and was attached as Army Troops to the 26th Division. They trained at Salisbury Plain and returned to Reading in November 1914. 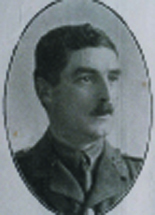 Ronald was promoted to Major on 30 December 1914. The Battalion moved to Sutton Veny in May 1915. (Sutton Veny was close to Warminster and Salisbury Plain: approximately 10 camps were built around the village and some 10,000 or more troops of the 26th and 34th Division were barracked there during training.) The Battalion left for France on 8 August 1915, landing at Le Havre, and transferred from the 26th Division to the 1st Brigade, 1st Division. The Battalion was engaged at the Battle of Loos in autumn 1915. 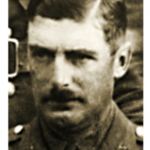 Ronald was wounded by a shell burst during the advance on Hulluch and Loos on 25 September and his battalion was almost wiped out. “5:50AM. The intensive Bombardment, preparatory to the attack on the German position SOUTH of the HULLOCH ROAD, began, the enemy’s artillery at once replying, though they inflicted little damage and caused few casualties in our front-line trenches. Simultaneously with the bombardment, the gas company began to operate the gas cylinders which were in the front-line trench, and there then occurred several casualties from poisoning, caused it supposed, by leakages in the cylinders. “6:28AM. The gas now ceased, and smoke bombs were thrown from the front-line trenches, proving entirely successful in screening our Advance. “6:30AM. The fire of our artillery lifted, and Battalion advanced in quick time, to assault the first line Enemy Trenches, the 10th Gloucester Regt being on the right, the 2nd Gordons on the left. The advance was opposed by heavy artillery and machine-gun fire, while the wire in front of the German trenches was found to be scarcely damaged, and it was in cutting a way through this obstacle that most of the regiment’s heavy casualties occurred. Shrapnel and machine-gun combined to play havoc in our ranks, and an additional disaster was the blowing back of our gas, by the wind, into our own ranks. However, after a struggle, the German first line was penetrated, and the trench found to be practically deserted, the enemy apparently, having deserted it earlier in the day, merely leaving behind sufficient men to work the machine-guns. Mainly overland, but with some men working up the communication trench, our line advanced successively to the 2nd and 3rd German lines, and met with but slight opposition. From the 3rd line a further advance was made, and an Enemy Field Gun captured. A 4th line German trench was also seized, but being in so incomplete a state that it afforded little cover from rifle fire and none whatever from shrapnel. COLONEL WALTON ordered the line to be withdrawn to the 3rd German line trench, and this position was occupied until the Battalion was relieved. “10:00PM. 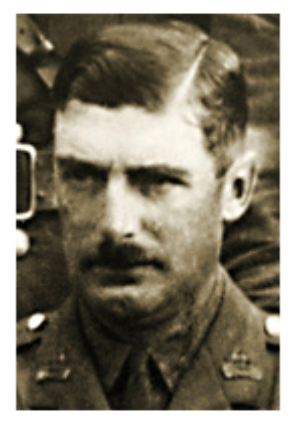 COLONEL WALTON was ordered by the Regimental Medical Officer to leave the trenches for medical attention, as he was suffering from the effects of gas-poisoning, and the command of the Battalion passed, for the night, into the hand of 2nd Lieut T.B. LAWRENCE. “The following is a report by Lieut C. GENTRY-BIRCH:- At this point (i.e. when the Battalion was negotiating in German wire) about 50 of the 8th R. Berks R became separated from the remainder of the Battalion and attached themselves to the Gordons advancing and taking the German guns in the 4th line German trench. They then advanced and occupied the road WEST of HULLUCH. We were unable to advance further owing to our artillery fire, which was falling short. We waited for support to come up, in the meantime starting to dig ourselves in. Ronald died from his wounds a month before his 40th birthday. The Commonwealth War Graves Commission website indicates that Ronald was buried at Etaples Military Cemetery, about 27kms south of Boulogne. The inscription on his headstone reads: “Greater love hath no man than this.” Ronald was awarded the Victory and British medals and 1914-15 Star. He is also remembered on memorials at Charterhouse School, Henley-on-Thames and Lord’s Cricket Ground. After his divorce, Ronald appears to have little further connection with the village. His military records show that his mother lived at Copse Hill, Henley-on-Thames and at Glenwood, Silverdale Road, Eastbourne. This perhaps explains why there is no mention of Ronald’s death in Datchet’s Parish Magazine. A number of Datchet men fought – and died – with the 8th Battalion, including John Hutton and William Wilkins who joined in October 1915, after the losses at Loos, and Leonard Groves who joined in December 1915. Ronald Brakspear is featured in a recently published book, A Group Photograph by Andrew Tatham. The author investigated the stories of each man pictured in a group photograph of all the officers of the 8th Royal Berkshire Regiment which was taken at Salisbury Plain in July 1915. Brief details about Ronald are published on the accompanying website, here. With many thanks to Alistair Ward for his research.